[Photo] Nyau dancer representing incarnation of the spirit of the dead, Chewa, Zambia, taken at Karisa in 1985. "Imaged Asia, Imaged Europe" Yoshida, K and B. Durrans (eds.) SELF and OTHER: Portraits from Asia and Europe. The Asahi Shimbun. "Introduction. Portraits from Asia and Europe: How have people depicted each other?" Yoshida, K and B. Durrans (eds.) SELF and OTHER: Portraits from Asia and Europe. The Asahi Shimbun. "'Images of Other Cultures' in Museums" Yoshida, K and John Mack (eds.) Images of Other Cultures. NHK Service Center. "A Note on the Joint Projects by the National Museum of Ethnology and the British Museum" Yoshida, K and John Mack (eds.) Images of Other Cultures. NHK Service Center. (With J. Mack) Preserving the Cultural Heritage of Africa : Crisis or Renaissance? Oxford: James Currey. Ethnographic Exhibitions Today. In K. Yoshida and J. Mack (eds.) Preserving the Cultural Heritage of Africa: Crisis or Renaissance? Oxford: James Currey. 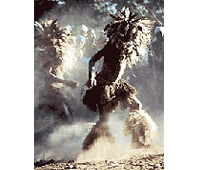 Kalumbu and Chisudzo: Boys’ and Girls’ Masquerades among the Chewa. In S. Ottenberg and D.A. Binkley (eds.) AFRICAN CHILDREN–S MASQUERADE – Playful Performers, pp.221–236. Transaction Publishers. A Fresh Start for Graduate Education at Minpaku. MINPAKU Anthropology Newsletter 21: 10. Ethnographic Museums and Public Sphere. Museum Cooperation 2004: Newsletter of the Intensive Course on Museology 1: 18–22. (With Y. Kawaguchi) Symposium Africa 2001: Representing African Art and Cultures (Senri Ethnological Reports 54), National Museum of Ethnology. Die Maske als Instrument: Warum Menschen sich ein zweites Gesicht schaffen. In C. Geissmar-Brandi, et al. (ed.) Gesichter der Haut, pp.181–188. Stroemfeld Verlag. (With T. Umesao and A. Lockyer) Japanese Civilization in the Modern World XVII: Collection and Representation (Senri Ethnological Studies 54), National Museum of Ethnology. “Tohaku” and “Minpaku” within the History of Modern Japanese Civilization: Museum Collection in Modern Japan. In T. Umesao, A. Lockyer, and K. Yoshida (eds.) Japanese Civilization in the Modern World XVII: Collection and Representation (Senri Ethnological Studies 54), pp.77–105. National Museum of Ethnology. Ethnographic and Cultural Exhibitions Today. In S. Inaga (ed.) Crossing Cultural Borders (International Symposium 14), pp.39–48. International Research Center for Japanese Studies. Re-Exhibiting Africa: From the Exhibition “Images of Other Cultures”. In E. Kurimoto (ed.) Rewriting Africa: Toward a Renaisssance or Collapse (JCAS Symposium Series 14), pp.193–207. The Japan Center for Area Studies. (With J. Mack) Images of Other Cultures, NHK Service Center. Masks and Secrecy among the Chewa. African Arts 24 (2): 34–45, 92, Los Angeles: University of California. Masks and Transformation among the Chewa of Zambia (Senri Ethnological Studies 31), National Museum of Ethnology.